S. S. Van Dine is at it again with a plot filled with more twists than a back country road. Taking place in a brownstone mansion equipped with its very own Egyptian museum, The Scarab Murder Case involves murder, love, jealousy, and corruption. All important ingredients to a truly excellent murder mystery. When an Egyptologist’s patron is found murdered at the feet of Anubis inside his personal museum hobby detective Philo Vance is forced to play a deadly game of real life chess with the murderer. With only his intuition to guide him, Vance predicts the ensuing actions of a deranged and desperate killer, but will he be able to do so before they kill again? This was a particularly fun read because of the subject matter. 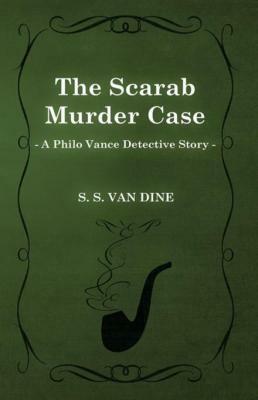 Van Dine certainly went into considerable depths to research the history of Egypt’s pharaohs and ancient artifacts to bring readers a comprehensive murder mystery that felt full and complete rather than relying on the murder itself as a crutch. The mystery itself, however, is not without merit. While my own intuition pointed toward a particular suspect I found myself in the same evidence lacking boat as Vance. The Scarab Murder Case was a quick read, loaded with motivation and page turning hooks. I recommend this book (and any of Van Dine’s Philo Vance works) to anyone who enjoys a good, clean murder without all the sensationalism of gore. You won’t be disappointed.